the deceased king asked the creator-god. a lifetime of millions,” the deity replied. 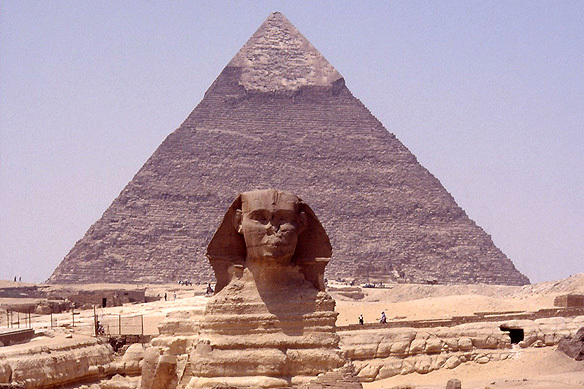 Egypt was ancient even to the ancients. Around 3100 BC, Menes Narmer, the first pharaoh of the first dynasty united Upper and Lower Egypt, creating the first united nation in history. The desert served as a barrier providing security to the people throughout the valley. The tribes merged into villages and the villages eventually cooperated with each other to make the most of the annual Nile flooding, enabling all to reap the benefits of a good harvest. Cooperation meant organisation, which the Egyptians were particularly good at. Egyptian history is divided into the early dynastic period (3100-2686 BC), three main kingdoms, namely, the Old Kingdom (2686-2160 BC), the Middle Kingdom (2040-1640 BC) and the New Kingdom (1550-1080 BC), and two intermediate periods of turmoil and instability. After 1080 BC, Egypt was ruled by a series of Egyptian and foreign rulers till the 23-year old Macedonian, Alexander the Great, conquered Egypt making it part of his Hellenistic empire in 332 BC. The ensuing Ptolemaic period saw Greek-born rulers rule Egypt in Egyptian style. What distinguishes Egyptian civilisation from others is that it was the earliest to weave the threads of civilisation into a truly remarkable culture and it lasted the longest, nearly 3,000 years during which it was ruled by 30 dynasties. The unique nature of Egyptian civilisation’s political and social structure took shape under the very first pharaoh, around 3100 BC, and stayed intact throughout its history. All power, in theory and in fact, lay with the pharaoh who was conceived to be god-king. The development of writing, mathematics and astronomy took birth during this same period to aid centralised rule. The craft of writing enabled records to be kept, orders given and history and literature written. Egyptian poetry and prose reached lyrical heights during the New Kingdom as is expressed in the poetry of the pharaoh Akhenaten in praise of his god Aten. Mathematics helped to compute taxes, measure land areas, distances and weights. The earliest calendar known to mankind was developed by the Egyptians based on the Sun. Divided into 12 months of 30 days each, it was followed by a 5-day festival period. The Egyptians also developed the first water clock to record time. Medical science too was born during the Old Kingdom. Egyptian surgeons were renowned throughout ancient times as evidenced by the Edwin Smith Surgical Papyrus and Ebers Medical Papyrus dating back to the New Kingdom. Under early dynastic rule vast irrigation projects led to economic wealth and subsequent trade. Native products such as papyrus, textiles and lentils were sold to Nubia (Sudan), and across the red sea and the Mediterranean in exchange for silver, gold, copper, bronze, myrrh, ivory and rare woods. Within 100 years of the Old Kingdom, stone instead of sun-baked mud-bricks started being used for building tombs and temples. Residential houses and palaces, however, continued to be built with mud-bricks which have been destroyed with time. 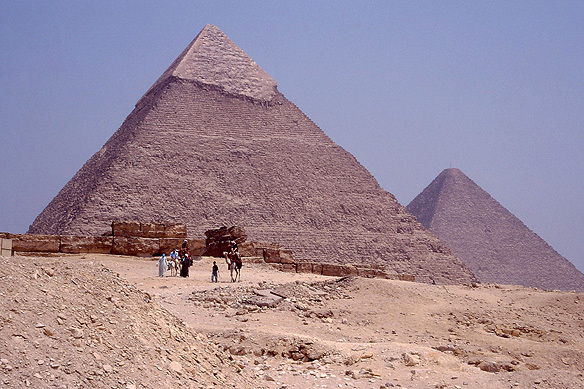 In less than 200 years the ancient people had so honed the craft of building with stone that the pyramids had been completed. The same centralised authority which could amass labour for irrigation now used the available labour for architectural projects. Art and sculpture kept pace with architecture. Egyptians loved colour. All sculpture and important buildings were vividly decorated and embellished. Temple walls were covered with official and religious scenes while animated frescoes depicting daily Egyptian life covered tombs and palace walls. 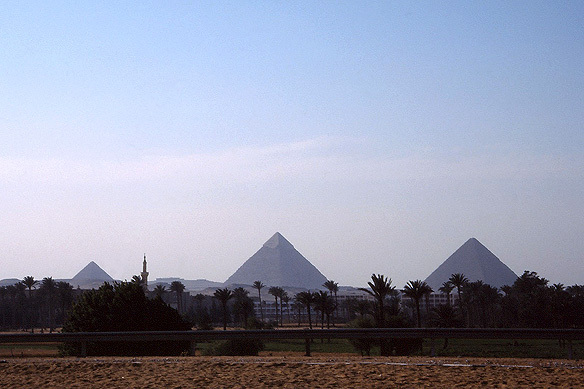 Modern man knows far more about Egyptian civilisation than of any other. The literature and history inscribed on the stone walls of the temples, tombs, monuments and papyrus sheets have helped to bring to life Egyptian history. Secondly, their religion which saw death as a continuation of life, together with the Egyptian climate, have helped to preserve and conserve scenes on the tomb walls, tomb furnishings and models which throw light on the Egyptian way of life in vivid detail. During the pre-dynastic and Old Kingdom only the pharaoh and his family were believed to be divine and immortal. However, by the New Kingdom anyone who could afford to pay a priest to chant the appropriate prayers, or get an artisan to inscribe them on the walls of his tomb or write verses from the Book of the Dead on a papyrus which was entombed with him, could achieve immortality, join the underworld and become Osiris. For the ancient Egyptians, afterlife was a continuation of the best moments of earthly existence. They spent a large portion of their life building tombs and stocking them with luxuries and necessities in preparation for eternity. They had the walls of the tombs decorated and models made illustrating activities that they and their servants would be carrying out in the hereafter. After the first intermediate period and the advent of democratisation in Egyptian society, it was believed that high birth did not exempt the dead from menial work. The tombs were, thus, stocked with hundreds and at times thousands of figurines called Ushebtis. In the hereafter, when the Gods called the deceased to work on the heavenly fields, the figurines were expected to answer and work in place of the dead, allowing them to rest and lead a life of leisure. Just as there were various gods and theories on Creation, similarly the Egyptians had different beliefs on afterlife and what it constituted. In the solar cult, based on the sun god Ra of Heliopolis, the deceased was said to board a solar boat and cross the heavenly skies. In the Osiris cult, based on Osiris, the deceased was assumed to go to the underworld and become Osiris, ruler and judge of the underworld. In the New Kingdom, the various theories were combined: during the day the deceased’s soul now visited the tomb, ate and rested, and at sunset it boarded its solar boat and went to the underworld. The Egyptians believed that after death the ka (soul) and ba (physical vitality) left the body. As both could come back anytime through eternity, the body of the deceased had to be mummified and preserved. The embalming ritual lasted from one to 70 days depending on the financial status of the dead. The lungs, liver, intestines and stomach were removed and preserved in separate canopic jars. The brain was destroyed, the heart left inside. After treatment with compounds of salts, spices and resins, the shrivelled and dried body was swathed in sheets of linen. The mummy was then returned to the mourning family where an “opening of the mouth” ceremony ensured that the deceased could speak, eat and drink again, after which it was entombed with food, clothes and jewels, and crown and sceptre if a pharaoh. Large processions of mourners led by shaven-headed priests wafting incense and chanting prayers accompanied the encased mummy to its tomb, first by barge across the Nile and then by ox-sledges across the desert. Once entombed, the ka, guided and protected by Anubis, the jackal-headed god, together with magical formulas and spells from the Book of the Dead, was thought to commence its journey through Duat, the underworld, to the Hall of Two Truths. On reaching the Hall of Two Truths it was judged by Osiris by having its heart weighed against a feather. If the heart was to be heavier, the soul would be devoured by Ammit, part lion, part hippopotamus and part crocodile, and made to die a final death. If the heart was lighter, the soul would be granted eternal life, the millions of years promised by the deities in the sacred texts. This entry was posted in Egypt, Exploring our World and tagged Ancient Egypt, Edwin Smith Surgical Papyrus, Egypt First Pharaoh, Egyptian History, Egyptian Mythology, Houses of Eternity, Mummification Process, Osiris Cult, Pyramid of Khafre, Pyramid of Khufu, Pyramid of Menkaure by Rama Arya. Bookmark the permalink.